If deafness can be diagnosed at birth, then the child can get educational support or hearing aids to help his or her development. Research at the University of Southampton’s Institute of Sound and Vibration Research (ISVR) helped to develop and evaluate a pioneering test that enables deafness to be detected in newborn babies. Since it has been adopted by the National Health Service, all newborn babies in the UK are routinely screened. The research at ISVR has contributed to the World Health Organisation’s recommendations in favour of universal newborn hearing screening. Before 2001, the standard test for permanent childhood hearing impairment (PCHI) in the UK was the health visitor distraction test. It was based on an observation of a seven month old baby’s reaction to a distracting sound. However, there were problems with this approach; the accuracy of such a subjective test and the relatively late age of the child being tested. It is much better if the child can be diagnosed as early as possible, so that he or she can be provided with educational support, hearing aids, or cochlear implants. The earlier these are provided, the greater the benefit to the child’s language development, overall education, and quality of life. The research challenge was to develop an accurate test for PCHI that could be carried out on all newborn babies immediately after birth. The performance of this universal screening programme also had to be assessed in the real-world setting of the National Health Service and rigorously compared with existing tests. Permanent childhood hearing impairment (PCHI) affects more than one in a thousand babies. If it goes undiagnosed, the condition can harm the child’s neuronal development and his or her ability to learn to speak or use sign language. This can also hinder their chances of doing well in education and employment. David Kemp had discovered that healthy ears emit low level sounds called transient evoked otoacoustic emissions (TEOAEs) which can be detected by a microphone in the ear canal, usually within a few days of birth. Following basic research into TEOAEs, ISVR researchers started large-scale trials of this screening method in the mid 1990s and collaborated in the Wessex Trial of 25,000 newborn babies, which compared the new technique with the health visitor distraction test. Another large trial confirmed the positive results; Professor Mark Lutman at ISVR analysed the findings and recommended policymakers consider a universal Newborn Hearing Screening Programme (NHSP) based on TEOAEs which would be more effective and cheaper than the traditional method. He and his co-workers were awarded the American Audiological Society Editors prize for outstanding research in 1997. The National Health Service in England has introduced the innovative method of detecting hearing impairments in babies, in part based on research at the University of Southampton. More than six million newborns will have been screened by the end of 2013. 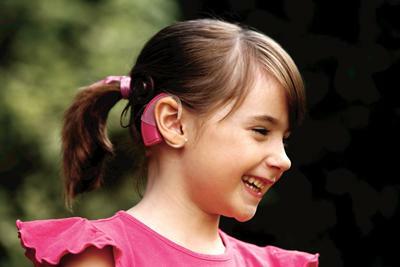 Universal screening using the accurate and swift TEOAE technique has helped health services detect PCHI in children and then intervene at an earlier age by fitting hearing aids or cochlear implants and supporting the children to fulfil their potential. A 2005 study in the Journal of Medical Screening found the median age for identifying children with hearing impairments was reduced from 60 to 10 weeks. The World Health Organisation recommended in 2009 that countries with available rehabilitation services should adopt universal newborn screening. The ISVR research has also been taken into account by policymakers in other countries, including the US and Australia.